Are you got bored using internet?? There i am telling some cute fun with the google for some fun just for you. 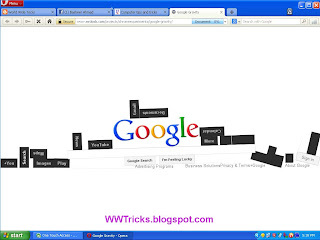 so there are 14 easy tricks you can play with the google to get some refreshment. so read the below 14 funny tricks. 2).Do a barrel roll: Type in google search bar "Do A barrel roll" click on i'm feeling lucky And enjoy do a barrel roll. 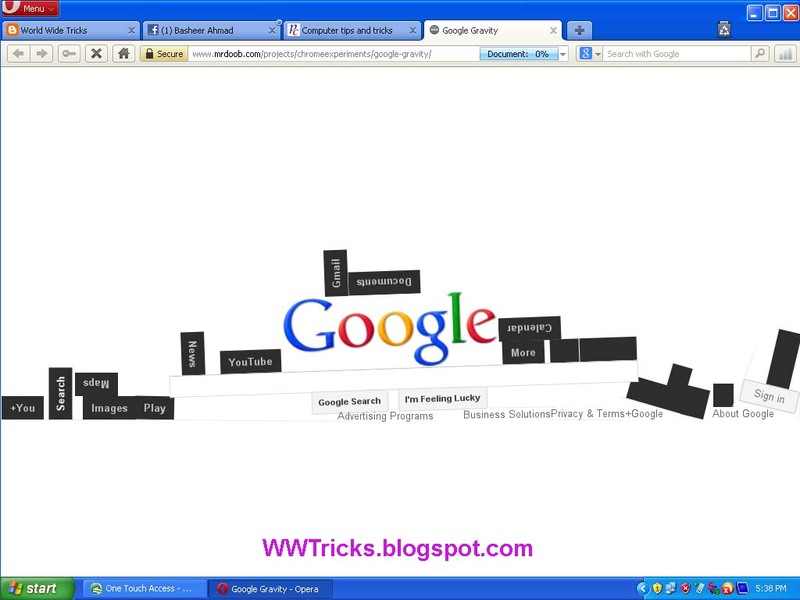 3):Google Gravity trick:Most amazing trick on google just type "Google gravity trick " and click on first result or simply click on this link and see just like this given below in the picture. you can move these with your mouse courser. :5) Askew: Go to Google.com and type Askew. Looks awkward right.....? i'm feeling lucky, this will make google tab dancing. 8).Google pacman:By typing in google search bar "google pacman" you will find a pacman game on the google tab. 9).Google Sphere: This will make all the words on the Google homepage move is a circulatory motion. 10).Annoying google:This will convert all the alphabits in the upper case and lower case randomly. 11).Epic google:Typing "epic google" and clicking on i'm feeling lucky, all the text will start increasing and will move out of your pc screen. google got hacked then just type "google hacker" and click i'm feeling lucky. of google and it will be so difficult to read the text. please must share it with your friends if you like these. Twitter assisting to improve the lives of others, it arrives back again on you with help as well.